For sellers who want the ultimate marketing and experienced broker to look over contract, offer advice/opinions and calculate closing cost. When you receive an offer, we will review it with you and offer advice. You take that coaching and handle your own negotiaitons directly with the Buyer's Agent. With this option you can choose if you would like to field the appointment phone calls or have agents schedule using Showing Time (a service that agents can use to schedule appointments online *where available). We will recive and review all offers with you and assist in the ontract negotiations with the Buyer's Agent. We will also assist with the 2nd round of negotiations that may result from the home inspection. We will offer guidance getting you to the settlement table and review your closing sheet with you prior to settlement. *All intereaction must be performed during business hours of M-F between 9AM and 5PM. We are here to make this an easy processs. Call us with listing questions Monday through Friday between 9-5. 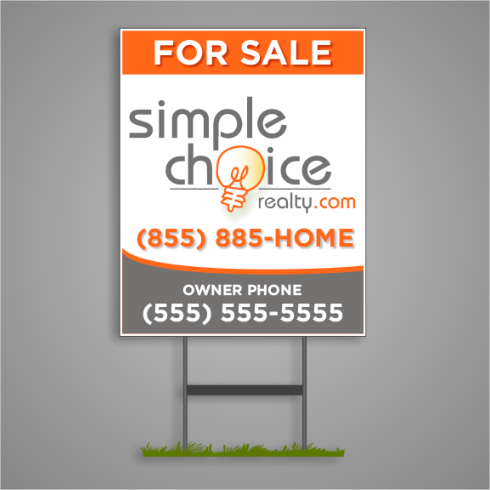 We will send you a PDF printout of the MLS listing, which can be used in flyer boxes, etc. Have a Premium Sign cusomized with your phone number. Premium Yard Sign is availble for $100. This is custom ade with your phone number on it. If your plan does not include this upgrade, you can always add it later as an "a la carte" upgrade. Flat Fee MLS Listing in Cheswold Delaware is the practice in the real estate industry where a seller enters into a listing agreement with a real estate broker who accepts a flat fee rather than a percentage of the sale price for the listing side of the transaction. The buyer's broker is still typically offered a percentage though that could be a flat fee as well. A discount flat fee MLS brokerage typically unbundles the services a traditional real estate brokerage offers and list the property for sale in the local multiple listing service (MLS) a la carte without requiring the seller to use its services for valuation assistance, negotiating, transaction management and showing accompaniment. Flat Fee brokers are real estate brokers, just like the national brand names, but offer discounted or unbundled services. Most flat fee brokers do offer full service brokerage services. In the Cheswold Delaware MLS ®, the listing agreement between the Cheswold Delaware real estate broker and the property owner typically requires the broker to enter the property into the MLS and provide other contracted services, with the broker acting as what the traditional industry has coined a "limited service broker". However, the flat fee industry prefers the term a la carte broker because the services are not limited. Instead freedom of choice is expanded to allow sellers to pick from a menu of services. For Sale By Owner MLS Cheswold Delaware ( Multiple Listing Service) is not different from traditional real estate brokerage services. Because the MLS requires a listing agreement between a real estate broker and property owner, the rapid explosion of discount flat fee service providers has created a gap in the States developing laws governing flat fee services provided by real estate broker.